There are two types of window cleaning – the spray wash method and the hand clean method, which is the only method that Sunshine uses. The Spray Wash Method is where workers stand on the ground, use your garden hose and shoot a lot of water at your windows. It knocks off some dirt and the windows are left to drip dry. Don’t be fooled by the price of this method. You get what you pay for. The Hand-Clean Method – which is the only method that Sunshine uses – is the Rolls Royce method of window cleaning. Each window is approached using a ladder, gently wet down by hand with soap and water, scrubbed, squeegeed, dried and sills wiped clean. This leaves the window spotless and perfectly clear. 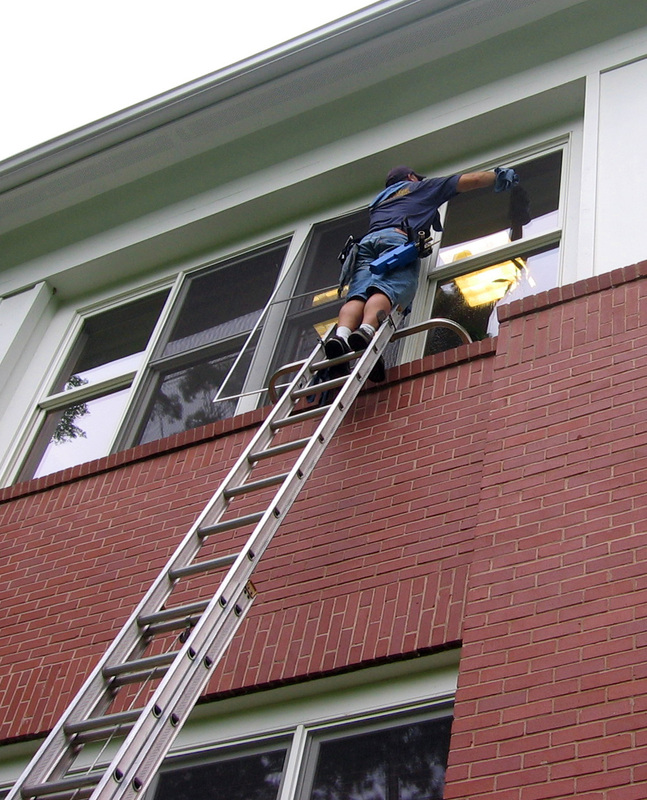 This high quality commercial and residential window cleaning is only a phone call away with Sunshine Window Cleaning in Atlanta. Our window washing experts get up close and personal with your windows using the hand-clean method and leave your windows crystal clear. In addition to our window cleaning services, we can clean high chandeliers, ceiling fans and skylights; dust high, hard-to-reach surfaces; and change bulbs in high-mounted floodlights. We have tall ladders and are happy to assist you with these hard-to-reach jobs. See our pricing page for more information on how to obtain an estimate or contact us and request a free quote. 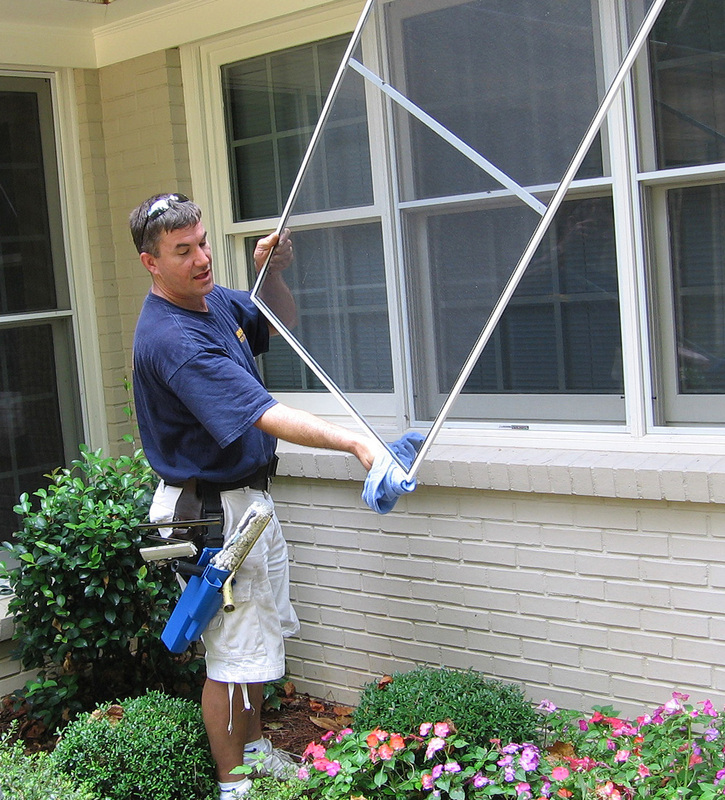 Please view our Atlanta window cleaning services video for a detailed explanation of how our professionals will be cleaning your windows, or keep reading. Each window is washed by hand, utilizing our ladders as needed. If there’s a screen, it is removed and wiped down. The window and sill are scrubbed with soap and water. The edges of the window and sill are dried with a towel. The rest of the window is dried with a squeegee. This procedure will be repeated for every window in your house. We are confident that you will be satisfied with our commercial and residential window cleaning services. To ensure you are happy with the results, we guarantee it. We will not leave your property until you are completely satisfied, and if you’re not available during the appointment, no problem; we will return to make it right. On October 13, 2016 I had my windows cleaned along with a chandelier. The man’s name was Buka. He had a good appearance, wore socks over his shoes and did an excellent job. Better than I’ve had for a long time. He represented your company very well. Was polite and business like. Phenomenal cleaning!! 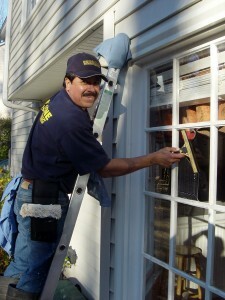 Buka and Gustavo were prompt, efficient and left with windows (and difficult lanterns) gleaming! Miguel and Aaron completed the job in 3 hours and did a wonderful job. Anthony and Alfredo (sp?) spent a good part of the day cleaning my many windows inside and out. They also pressure washed my walkways, patio and driveway. They did an awesome job on everything and my windows were really filthy on the out. I would highly recommend them for your home needs. The staff (Delano) did an amazing job. Very professional and detailed. Great communication from beginning to end! I just had the best experience with the guys who came to clean my windows September 30, 2016. They were professional, timely, efficient and polite – and did the best job on my windows. They sparkle! Better yet, they were the same people who came as the last time I hired Sunshine 13 years ago, which shows that the company is a good, stable employer. I would recommend them highly! Sunshine Window Cleaning cleaned my windows on Saturday. They moved the furniture but put everything back in place once they had finished cleaning the windows. I would recommend them to my neighbors. polite and efficient and did a great job, even though he did the whole job without an assistant. He was very helpful in removing and replacing articles in front of the windows. I would not hesitate to recommend Sunshine to friends and neighbors. Today we had our home’s windows cleaned, inside and out, including storm windows and screens for the first time in probably 15 years. The service man was Anthony Rodriguez. He was polite, professional, and accommodating. He did an excellent job and now my windows look beautiful! I would cheerfully recommend your company to friends and family! Second time using these guys and just like the last time, they did a great job! Alex (and I’m not sure the other guy’s name) were on time, professional, and thorough. All windows look fantastic. They also replaced a hard to reach light bulb for me. Very happy with this company and their crew. Would recommend and will definitely be using again next year. I had all the windows in our home cleaned today for the first time with sunshine window cleaning. Anthony and his partner came out and did a great job. I will have them come out every time I need them cleaned. Price was great and they were fast. Not a streak any where. Great job and I will refer them to people I know. Yes, we give estimates. The best way is to simply call our office, we will ask pertinent questions about your house and put you in a ballpark price range. If that price is good for you we can put you on the schedule to come out. When the techs come out to actually do the work, they will give you firm prices BEFORE they do any work. When you give them the OK they will go to work. Buka and Gustavo just cleaned every window in my house, inside and out. They were very neat, professional and friendly. My windows look so good! I would recommend Sunshine Window Cleaning to all my friends! Andres and his partner did a fantastic job of cleaning our very dirty windows and blowing off the roof. Highly recommend Sunshine Window Cleaning. Anthony and his team did a fantastic job on my windows inside and out He was very professional and double checked all the windows after cleaning to make sure they were sparkling clean. I am a long time Sunshine Window user and this is one of the best teams I’ve had. Will definitely request him again. Delano and Robert did an amazing job! Such nice guys and very professional! I can’t believe the incredible job Anthony and his team did at my home. The job was huge and frankly, quite daunting – 11,000 s.f. home with more windows than I could even count for the estimate. So, Sunshine sent two crews, they took their time explaining the process and gave me a very fair quote. Incredible experience overall – they made my home sparkle – windows so clean I can hardly tell there are window panes in them. Thank you, Sunshine. The gentleman that came to my home was professional and courteous – but best of all he did a fantastic job of cleaning my windows (all 37+ of them). He has made my windows sparkle like they have not in years! My rooms are brighter and it makes the entire house feel like it has all been spring cleaned. Thank you – I will be in touch again. Absolutely love this company! John and Alfredo arrived early, were friendly and efficient, and did an amazing job. They even blew off our patio! Such a pleasure to do business with such a great company. Buka and Gustabo cleaned our windows yesterday. Our area has been busy with new home construction and they did a great job for our first professional window cleaning!Five stars to you! Buka and Gustabo cleaned windows (inside and out) in my home a few weeks ago. They both did a wonderful job! They were prompt, very hard working, pleasant and thorough. Great attention to detail. They went the extra mile! I would certainly hire them again, and will go to Sunshine next time I need my windows cleaned. Last week I used your window cleaning service for the first time. I want you to know how pleased I was with your service…Randy and Ricky did an excellent job and were very thorough and caring. I will definitely recommend you to others. Sunshine Window Cleaning is extremely professional from the initial contact requesting pricing information to the guys coming out and completing the service at our home. Terry and I will definitely use Sunshine again! Chris and his assistant cleaned the windows at my house yesterday. That was the first time I have ever had my windows professionally cleaned. I am thrilled with the results and found the price to be fair. Chris was highly professional and meticulous with his work. He is a very nice person and I was completely comfortable being at home by myself with them cleaning my windows. I am sorry I can’t remember the assistant’s name but he did a very nice job, also. I will definitely use Sunshine the next time my windows need to be cleaned and will be asking for Chris to come again. Now I will enjoy my clean windows! Great experience. They called ahead of arrival, very professional and efficient, and did a great job on the window cleaning. Will certainly use Sunshine again. Delano and Donte cleaned our windows last week and did a great job. They were polite, enthusiastic and thorough. Very careful not to damage landscaping. Thanks guys. Sunshine Window Cleaners are EXCELLENT! They arrived on time and did a thorough job. We are very happy with their window cleaning and pressure washing services and highly recommend them. Josh came to my house in early December to clean my windows as well as my crystal chandelier and the hanging light on my front porch. He did an exemplary job, but when he finished cleaning the front porch light and reassembled it, the lights were not functional. He tried a number of times to fix it but ultimately determined that the fixture itself was just worn out. Josh said that if I would buy another fixture, he would come back and install it for me and that he did. He assisted me with the process every step of the way, which I very much appreciated. Josh was wonderful and I highly recommend him! He didn’t stop where his job ended but insisted on going the extra mile. I have recommended him to several friends and will continue to do so! We just used Sunshine Window Cleaning, and they did an excellent job. Oh my gosh, Sunshine, they were very professional. The two guys that came in, one of them had been cleaning windows for 16 years, I think he said. They did a super job, and actually, there are a couple windows that we haven’t been able to get open for like ten years, and they managed to get those opened and cleaned. So, they did a great job. On October 13, 2016 I had my windows cleaned along with a chandelier. The man's name was Buka. He had a good appearance, wore socks over his shoes and did an excellent job. Better than I've had for a long time. He represented your company very well. Was polite and business like.